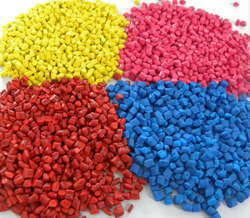 Leading Manufacturer of pvc compound granules from Mumbai. Available Colors Yellow, Pink, Red, Blue, etc. Our spacious infrastructure unit helps us engage in the manufacture of high-quality PVC Compound Granules in a hassle-free manner. They are fabricated using superior quality plastic by employing advanced machines and technology.